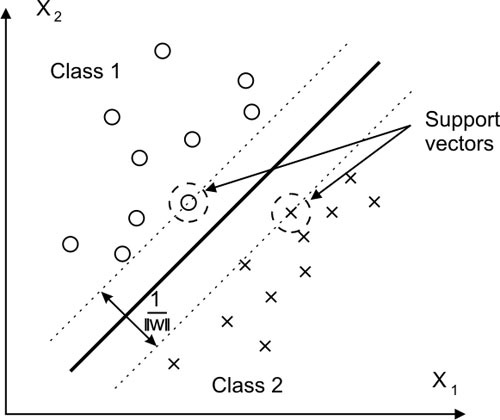 For classification of ultrasonic signals in A-scan we used pattern recognition method called support vector machines (SVM). In this study we classify signals with fault echo, echo from weld and back-wall echo. Ultrasonic signals were measured on material used for constructing airplane engines. The experimental results indicate the performance of the proposed approach. The SVM maximizes margin between classes which increases generalization ability. The classification problem can be restricted to consideration of the two class problem without loss of generality. In this problem the goal is to separate the two classes by a function which is induced from available problem. The goal is to produce a classifier that will work well on unseen examples. The basic idea is linear classifier that maximizes the distance between separating hyperplane and the nearest data point of each class. For the feature extraction the characteristic properties of ultrasonic signal have to be used. From the shape of ultrasonic signal which was measured on different place contains the fault and backwall echo, only the backwall echo or the signal from the center of weld the basic amplitude characteristics were derived. The basic features include mean value, root mean square value, standard deviation, and absolute value. For the calculation of descriptive features the back-wall echo was cut off. The average, root mean square a standard deviation value were computed from the back-wall echo and from the rest of the signal. The signal which contains only the backwall echo has the smallest average value but in the opposite the signal measured in the centre of the weld has the higher average value because the signal in the centre of the weld contains more echoes which were caused by scattering of the signal. The features of ultrasonic signal were put into the SVM classifier and the hyperplane was computed. With this method it is possible to classify the signal with back-wall echo, signal with fault echo and signal measured on weld. 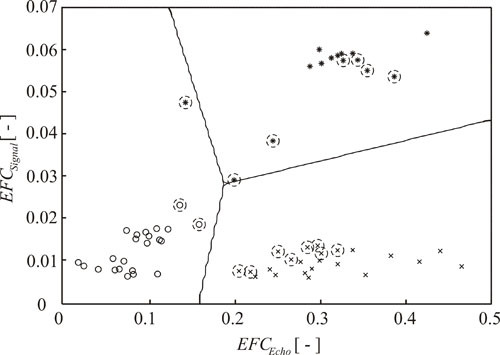 The proposed method is useful for the automated classification of ultrasonic signals in industry.